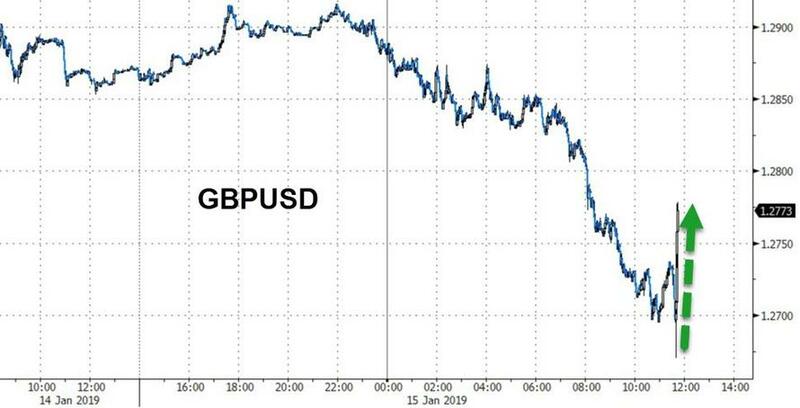 Update 5: The pound kneejerked lower, but swiftly recovered as traders realized that the overwhelming defeat means the EU may now reconsider its decision not to reopen negotiations. It’s now up on the day. 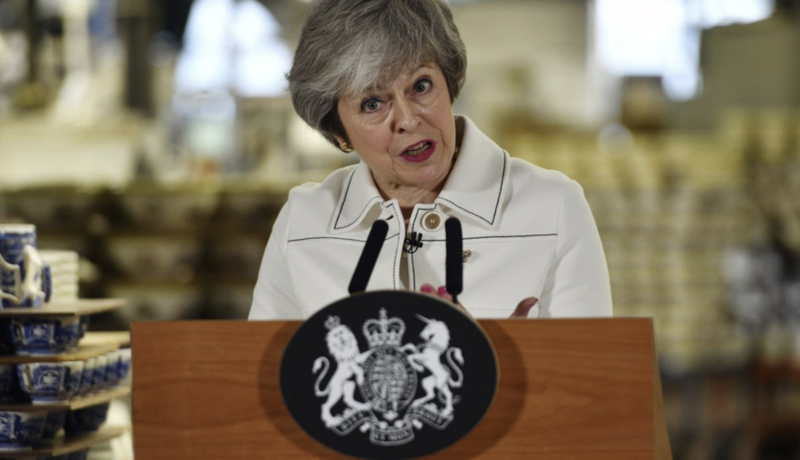 May said in a speech that “we must focus on ideas that are genuinely negotiable.” She also denied that the government’s strategy is to run down the clock. Before officially tabling his motion of no confidence, Jeremy Corbyn called for a permanent customs union, saying a permanent customs union must be secured, after gloating over the worst defeat for a government since the 1920s. No deal must be taken off the table and people’s rights and protections must be secured. Update 4: May has lost by a 230 vote margin. As the results were read out, the Commons erupted in commotion. Update 3: Minutes before the final results are due, reporters have noted that the ‘no’ lobby is mobbed. “It’s safe to say May’s deal is sunk”, one commented. Word is the government only has 202 votes – which would mean a sizable defeat. That would be 475 against, an overwhelming rejection that would bring her ability to schedule another vote into question. Though that’s nothing we didn’t already know. Update 2: The Baron amendment has been rejected by a vote of 24-600. The amendment would have called for the UK to have the ability to unilaterally leave the backstop. The rejection of the amendment, which May opposed, is a resounding win for the prime minister. Cable has caught a slight bid on the news. Stocks legged lower after the Brexit headline hit, which could be a sign that algos read “reject” in the headline and reflexively dumped. Update: The voting has just begun but there’s already been a handful of surprises. Three of the four accepted amendments have been dropped, so voting will proceed on the final amendment (the Baron amendment, backed by a cross-party group of legislators) before proceeding directly to the motion to pass. 317 is the magic number needed for the motion to pass. Bloomberg now expects the final tally to arrive by 2:30 pm ET. Cable is flat as voting begins. After months of fractious negotiations during which Theresa May has repeatedly tried – and failed – to win over intransigent Tories and members of the small Northern Irish party upon which she depends for her tenuous Parliamentary majority, May’s supremely unpopular Brexit withdrawal deal is finally coming up for a vote in the House of Commons. Almost nobody, including May herself, expects it to pass. In fact, most analysts expect the deal to be defeated by a wide margin of at least 150 votes, which would be tantamount to the worst defeat for a British government in 95 years, according to Bloomberg. At least 70 members of May’s party have publicly pledged to oppose the deal, and members of the Brexiteer European Research Group have also vowed to vote down each of the four proposed amendments that MPs will be decided before the deal comes up for a vote. May has just over two months to secure a withdrawal agreement palatable to both Parliament and the EU27 leaders, or risk a delay of Article 50 – which would push back the Brexit deadline – or possibly a chaotic ‘no deal’ outcome (though Parliament has recently taken steps to ensure that a ‘no deal’ exit would require the explicit approval of Parliament). UK diplomats are reportedly already working under the assumption that the March 29 “Brexit Day” will likely be delayed. 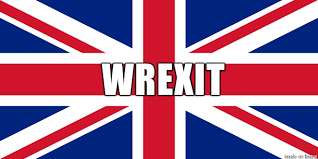 Per the Wall Street Journal, four amendments to the motion to pass the deal have been selected by John Bercow, the Speaker of the House of Commons, including one that would exclude a no-deal Brexit and another that would put a time limit on the UK’s transition out of the EU. Another amendment, which May has said isn’t palatable to Brexiteers (or the EU) is the Leigh amendment, which would put a time limit on the backstop. Corbyn amendment, SNP amendment, Edward Leigh amendment and John Baron amendment. In theory, the amendments would give May, Parliament and the EU a better idea of what Parliament would accept. May is expected to return to Brussels within 48 hours of Tuesday’s vote to meet with EU leaders, who have recently signaled that they might be open to making some minor changes to the deal. But a stunning defeat in Parliament is seen as an essential step before this can happen. Shortly before the vote was scheduled to begin, headlines crossed the wires reporting that May would return with an even better Brexit deal next week (an amendment passed last week requires May to return with a ‘Plan B’ within a few days of the deal’s defeat). The latest reports suggest that May’s efforts to convince some Tories to abstain instead of voting against the deal have been ineffective, which suggests the deal likely will lose by a sizable margin. Labour has confirmed that it will be voting against the deal. Party leader Jeremy Corbyn has also threatened to table a motion of no-confidence in May’s government if she loses the vote, saying that Labour would seek another general election. 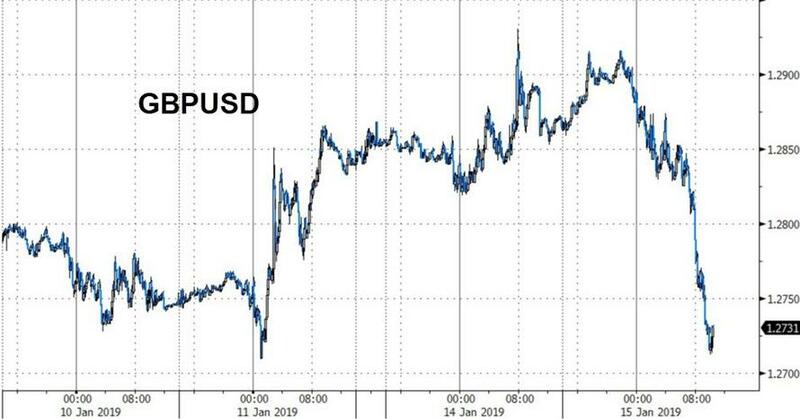 As analysts try to suss out what the vote could mean for the pound, a team from Capital Economics said that an inconclusive moderate defeat could be the worst outcome because it would increase uncertainty by taking away some incentives for May and the EU to compromise. A narrow defeat of only 50 votes could send sterling higher, perhaps above $1.30, while a miracle victory for May could send the pound all the way to $1.40. 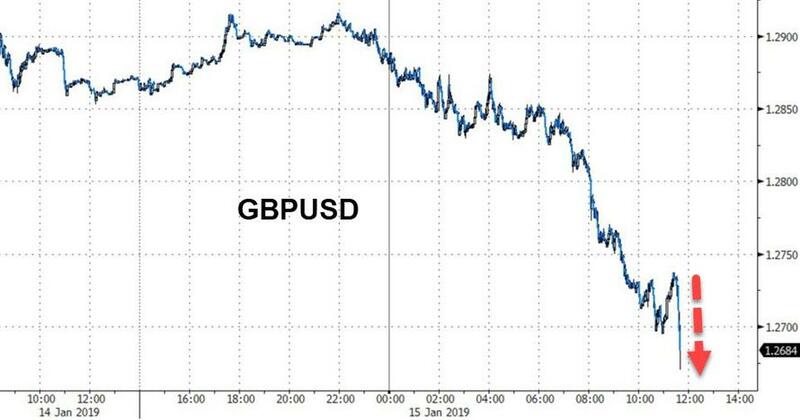 Meanwhile, cable slipped under $1.27 as traders waited for the votes to begin (currency traders have weighed in with various takes on what they believe could happen to the pound). Given the confusion around the arcane Commons rules being invoked to push through the amendments, the House of Commons twitter account has published a handy guide to how the voting will proceed. How will voting on amendments work this evening? After announcing his provisional selection of amendments, the Speaker explained the process and we've turned it into a diagram to make it easier to understand. Looking beyond Tuesday’s vote, Deutsche Bank tabulated the odds for various Brexit outcomes. Ultimately, a loss of 150 votes or more could increase the chances that May resigns or is pushed out following the vote (text courtesy of Deutsche Bank). A) May resignation/withdrawal of cabinet support: 20% probability. While we think this unlikely, there is a chance Prime Minister May resigns following the vote, particularly should the government’s loss be toward the top end of the scale mentioned above. Another possibility is the cabinet collectively withdraw support, making her position untenable. The main reason why we see this as unlikely is that under Conservative Party rules, unless MPs can agree on a single candidate to replace the Prime Minister, a leadership contest would follow. As Conservative MPs will find it difficult to agree on a single replacement candidate, unless Prime Minister May chooses to resign, we think the cabinet will seek to avoid a de-stabilising leadership contest. Should May resign and a leadership contest materialise, we would anticipate a pro Brexit candidate to be successful. 1While this would increase the likelihood of a no deal Brexit, our base case would be that new elections result, particularly if government policy pivots towards no deal. B) May remains as leader: 80% probability. The government will then have to provide an updated Brexit strategy to parliament by Monday 21st January. In these circumstances, we see five corresponding scenarios, in order of least to most disruptive. 1) A cross party consensus: 30% probability. Having lost the vote, Prime Minister May pivots towards a cross party approach to EU negotiations or parliament agrees an alternative negotiating mandate and instructs the government to follow it at the next vote on the 21st January or subsequently. For a cross party compromise to be reached, we think it may be necessary for the Labour Party to call, and lose, a vote of no confidence in the government first. We envisage a new mandate would instruct the government to renegotiate the Political Declaration on the Future Relationship towards a softer future relationship. 2 In conjunct with firmer EU commitments linking the Withdrawal Agreement and Political Declaration on the Future Relationship, such a deal should probably carry majority support in parliament. A small (two to four weeks) extension of Article 50 becomes necessary, as well as another round of EU negotiations. We envisage the EU27 would be flexible on both extending Article 50 and reopening talks on the future relationship. This is the most positive scenario, with markets being able to forecast an orderly outcome with a relatively high degree of confidence. 2) A lack of alternatives: 10% probability. Parliamentary consensus does not emerge on the next steps by the vote on the 21st January, or subsequently. Prime Minister May then uses multiple votes to force the existing deal through parliament in the face of a crash Brexit, perhaps after some cosmetic changes to the existing Withdrawal Agreement, and likely with market pressure. Again an extension of Article 50 from the EU27 becomes necessary. This is a more bearish scenario in that it may require market pressure or downside economic risks materialising for MPs to agree. 3) A second referendum: 15% probability. The government’s policy switches to seeking a second Brexit referendum, or (more likely) MPs direct the government to call one at the vote on the 21st January or subsequently. Article 50 is extended to July, or perhaps beyond. We have slightly increased the probability of a second referendum following reports over the last few days the EU27 could envisage an extension of Article 50 beyond the EU Parliament elections in late May, and perhaps well beyond when MEPs take their seats in July. We still believe a bigger sticking point to a second Brexit vote is that while parliamentary consensus could emerge to hold one, consensus on the question asked of the electorate will be more difficult. 4) A new election: 15% probability. May loses the vote and the Labour Party calls a successful confidence motion in the government. After two weeks, assuming a new government cannot be formed, a new election would follow under the Fixed Term Parliament Act. In this scenario, again an extension of Article 50 would be required. We do not see this as a positive scenario in that polls indicate both major parties are close to tied, leading to the risk of an election leading to similar parliamentary gridlock as at present. For a no confidence motion to be successful, the government will have to formally lose the support of the DUP, or a similar number of Conservative MPs from either the extreme pro Brexit or soft Brexit wings of the party. 5) A no deal/crash Brexit: 10% probability. Political deadlock leads to no deal Brexit. This could materialise if a parliamentary consensus does not emerge on an alternative deal, or Prime Minister May fails to get the current Withdrawal Agreement through parliament after multiple times of asking, and a motion of no confidence in the government is unsuccessful. May winning tomorrow’s vote. While we had attached a probability of 40% to May securing political support for the Withdrawal Agreement last week, this was contingent on May pivoting towards a cross party approach in the meantime, which has not materialised. We now do not think there is a realistic probability of the government winning tomorrow’s vote. Revocation of A50. Following a ruling from the ECJ, it is now technically possible for the UK to unilaterally revoke the Article 50 process (the UK’s exit from the EU). Revoking Article 50 would carry an enormously high political price, however, and we do not see it as likely at this stage. Amid all of the chaos ahead of the vote, there are really only two outcomes that most analysts agree on. May will almost certainly lose on Tuesday, and Brexit Day will almost certainly be delayed as May and the EU finally begin work on a modified deal that might have a chance of passing Parliament.